The Veranda was another name for a wrap-around porch with Wicker furniture, several thick posts, and wooden floors. It was considered proper to take walks on the Veranda and discuss art, literature, and music. Also, enjoying a light meal or a cup of tea on the Veranda was especially nice. 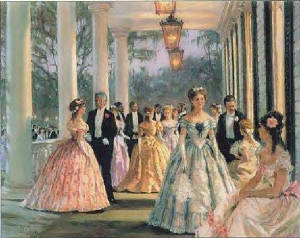 In the springtime or early summer, it was most enjoyable to hold a dance out on the veranda and enjoy the cool night air. Women were expected to be the lady of the house first, and mothers, wives, sisters, daughters, cousins, and friends second. A woman's job was to oversee the housework, meals, cleaning, finacial accounts, the training of servants, the correction and teaching of children, grocery shopping, and act as hostess. A woman's day was filled with necessary work as well as the duties of a refined lady to entertain guests. To view authentic Dresses and Hairstyles of Civil War Women, Children, and Gentlemen tin types, click below. A woman's role did not change much during the Civil War. In fact, it included all the normal duties of being a lady, but now included the many duties of the men who had gone off to war, such as overseeing servants/slaves (if servants remained at the house), the mangament of the crops, fieldwork, farm animals, as well as taking the crops to market to sell. A woman's life became harder during the Civil War as she struggled to provide food for her family during the blockades (in the South), keep a roof over her head, and do the work of both man and woman on the plantation. Many women not only accomplished this, but also became spies for either the Union or Confederacy, acted as nurses in field hospitals and local hospitals to wounded soldiers, camp cooks for army camps, and some even disquised themselves as men to actually join in the fighting during the Civil War!